For a few years now, Google has sometimes shown featured snippets where the text is from one site, but the image shown within the featured snippet itself is actually from a second site. Last year, Google confirmed that it would continue doing this, and it wouldn’t change how it sometimes selects a more optimal image for the snippet. John Mueller from Google went into a bit more detail today about the situation and explained why Google will sometimes show an image that is not from the same site as the snippet. It comes down to the fact that Google doesn’t feel that whatever image is available on the page that the feature snippet is taken from, would not the best choice for the image within the featured snippet. 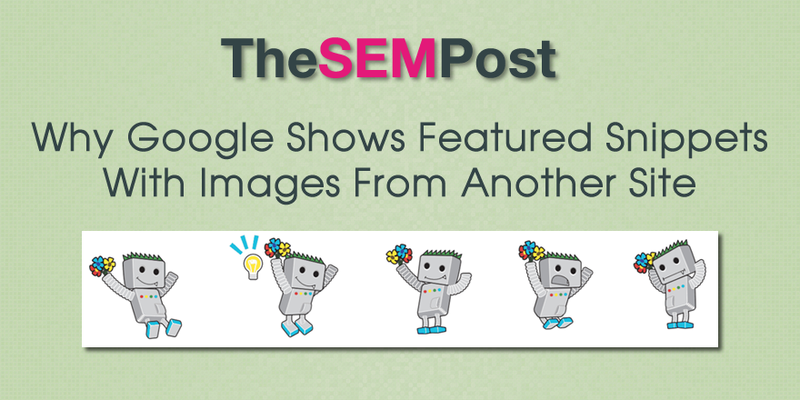 When Google does not choose the image from the featured snippet landing page, it often chooses the image that is ranking number one for the same query but in Google image search. If you have a feature snippet, but another site has the image on that snippet, there’s definitely room for improvement. Obviously Google thought your site was good enough to show the text but for some reason, they thought your images were lacking – or you might not have an image on the page at all. So you need to work on including an image that Google would consider better than the one currently shown. Having very clear and concise filenames that match the image. Using the ALT attribute to describe the image. Link to the image as well with appropriate and descriptive anchor text. Include a caption on the image. These are all things that will help Google better understand the images on your page and increases the chances that your image will be selected as the featured snippet. It also has the added bonus that Google might select one of your optimized images for a featured snippet, even if you have been unable to score the text part of that snippet. Do note that Google does not currently use OCR for images, so it’s not going to use the actual text on the image itself for image SEO purposes. You can also include multiple images on the page as well, as long as they match what the article is about. This gives Google some choices about which image display. Also look at the type of image the Google is currently showing the featured snippet. You obviously don’t want to go and stealing competitors image, but by looking at both the image and the landing page that the images on, a lot of insight about why Google selected that image for for that particular featured snippet, then you can make sure that you are doing something similar with an image that is just as good.